The news is relentlessly bad, triggery, and heartbreaking. I go back and forth about these blog posts, because I don't want to seem frivolous when so much bad stuff is going on. But -- I want to celebrate our creativity, and I also want to express gratitude for our friends who've made a recent four weeks of costume parties possible. 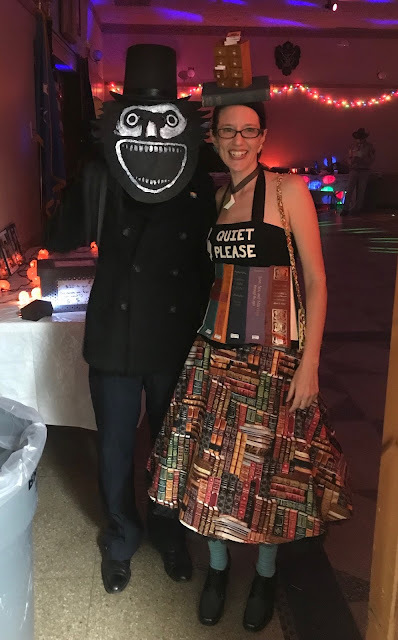 And I'm also hoping that our silly costumes will bring a smile to the face of you, Reader. No more costumes for us for a while. But I'm brainstorming next Halloween :o). And that's that. I hope you are finding some light this November, dear readers. 'Tis the season et cetera, so here's a reminder about how to order signed/personalized copies of my books from my local indie, Harvard Book Store. If you click on this link, it'll take you to the store's inventory of my books. There you can place your order. Just be sure to note in the comments field whether you'd like it signed and personalized, and, if personalized, to whom. I also tend to write a brief inscription of my choice, and am happy to add birthday or holiday greetings, encouragement to writers, etc., if requested. If you're tempted to ask me to inscribe something beyond that, please note that I'll only do so if it's something I feel comfortable signing my name to. One last note: Though I do still live nearby, I no longer live right around the corner from the bookstore. I can't always get into the store right away, so if you're buying holiday presents, don't delay!